Beginner Lessons are available daily from June through October from 8 to 9:30 am. We start learning the stroke on land in a rowing simulator, then in a boat designed for rowing in open water in the ocean, so they are very stable. Students may progress to more advanced rowing shells during the lesson progression. 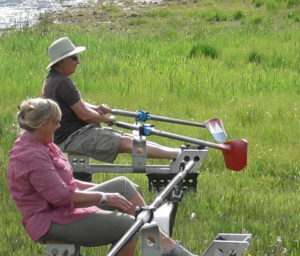 The coach follows the rower in a special wakeless launch while on the water. A se ries of 4 lessons are offered. After the student has completed the lessons a club membership is available at a discounted rate. (The total of 4 lessons and membership is equivalent in cost to the regular annual membership.) Please check the Rules under membership. A student may take 1 lesson “to try it out” or as a refresher. Group lessons max 4 people per session. It’s usually cool in the mornings. Wear clothing appropriate for biking or cross country skiing. Snug-fitting clothing, tights, quick dry top, maybe a windbreaker. Oars sometimes get caught in sweatshirts with big pockets. Long, loose tops may get caught in tracks. A change of clothes to be safe. Phone in a waterproof case if you want to take pictures. Bring a water bottle. PFD: You will be provided with a belt-type personal floatation device. We have an adaptive rowing program. An individual with special needs will row in a double rowing shell with an experienced rower. We have 2 rowing shells with specially designed seats. Contact us to schedule. You may bring this with you the day of your lesson. We will take cc, check or cash. Email friscorowing@gmail.com to schedule lessons and coaching. Clinics will be available during the season for intermediate and advanced rowers. Refresher lessons are also available. Contact us for information on upcoming clinics and Junior Camps.